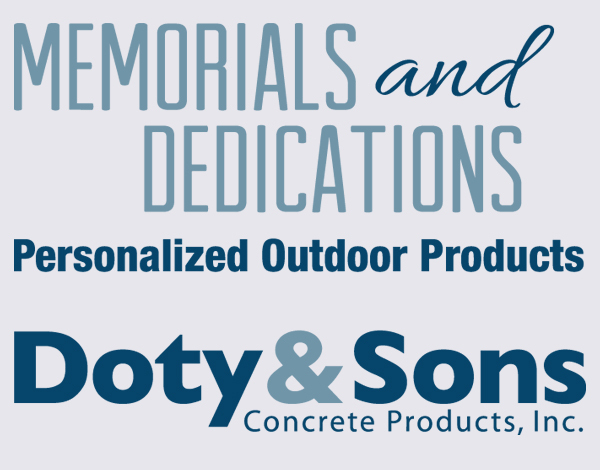 This memorial products web site features products manufactured by Doty & Sons Concrete Products, Inc. Memorial Products include: benches, planters, memorial plaque bases and tables. These products are a great way to remember and pay tribute to friends, loved ones or associates. Memorial benches and products can also be used to commemorate fellow workers, classmates, or golf partners. Memorial benches make great donations for parent teacher organizations for recognizing teachers or remembering students. Benches can be used on golf courses to remember golf partners or designate holes and yardages. Local clubs can recognize past presidents, members for years of service, or gain exposure by donating benches or other products to the community. Veteran organizations find that benches and memorial plaque bases are great on and around war memorials. Our memorial cemetery benches and Memorial Park Benches are great for remembering loved ones, friends, or family.